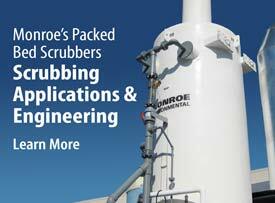 Monroe Environmental is a single source solution for highly durable and efficient Packed Bed Scrubbers. 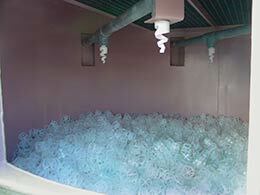 A Packed Bed Scrubber is a wet scrubber that removes acids, soluble gasses, chemicals, fumes, and odors. 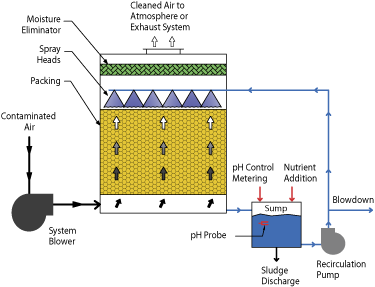 Contaminated gas flows through a specially designed packing media that is wetted with recirculated liquid. 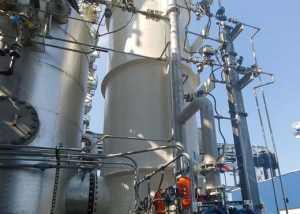 The liquid solvent absorbs the gas pollutant by physical or chemical means. A blowdown from the tank with makeup water addition removes contaminant products before they precipitate. 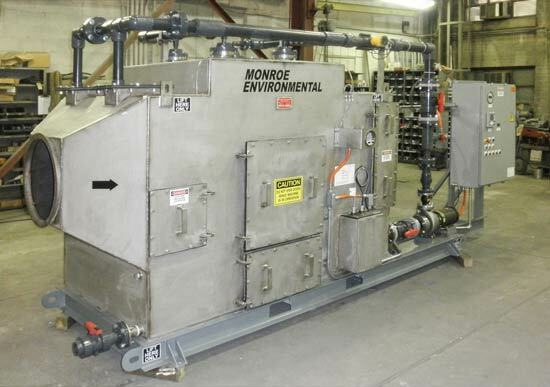 Monroe Environmental offers complete in-house fabrication and engineering services to provide high quality solutions at a low price. 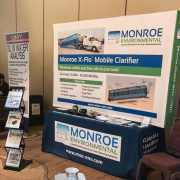 Monroe Environmental supports its customers with installation, start-up assistance, training, and field service. 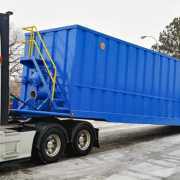 Each Packed Bed Scrubber is sized and designed for specific customer requirements. 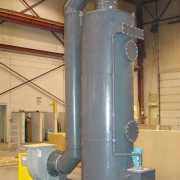 We will evaluate fume removal applications to determine the optimum design parameters for each installation. 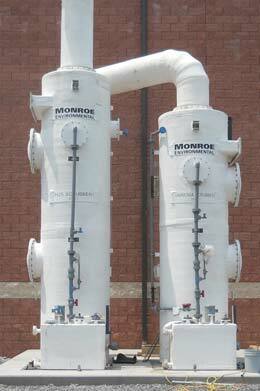 Monroe Environmental designs and builds complete scrubbing systems including multiple stages when required. 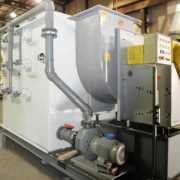 We also design liquid clarification systems and other air cleaning devices, and can provide integrated complete systems. Wide range of packing media including rings and saddles in various materials. Structured packing is also available. 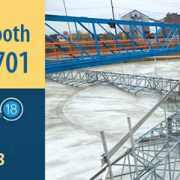 Complete instrumentation and electrical controls are available for stand alone operation or connection with a facility’s centralized control or monitoring systems. 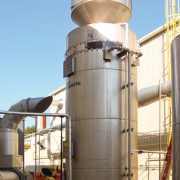 Chemical treatment, including oxidation and neutralization, is available to increase absorption of gaseous pollutants. pH control available when applicable. 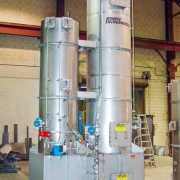 Corrosion resistant AMCA rated fan on the inlet or outlet side of the scrubber. Corrosion resistant recirculating pumps for scrubber liquid re-circulation. 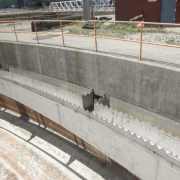 Non-plugging spray nozzles for wetting packing in a wide range of corrosion resistant materials. Special liquid distributors may also be used. Moisture eliminators with chevron, mist pad, or loose fill type designs. 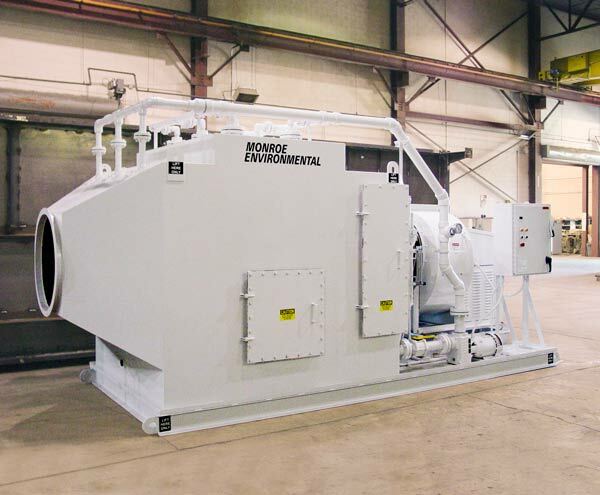 Monroe Environmental Packed Bed Scrubbers are custom designed to meet or exceed the specific removal efficiency required for each customer’s application and process. 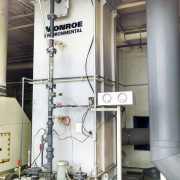 Monroe can also provide a process simulation for difficult or unique scrubbing system applications. 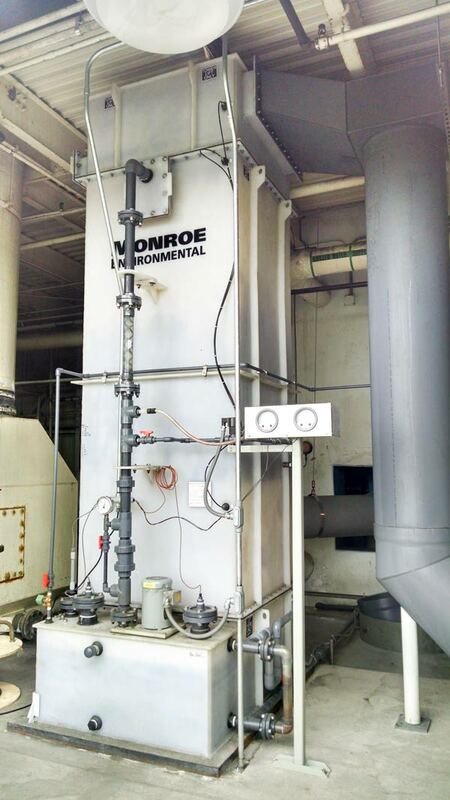 Monroe engineers will optimize the performance of each unit by thorough evaluation of relevant parameters. 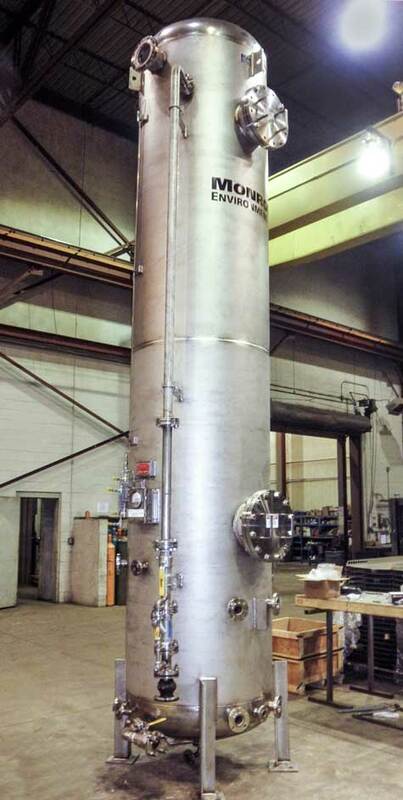 This vertical assembly is a counter-flow design with contaminated gas flowing upwards and recirculating liquid spraying downward into the packing media. Gaseous contaminants are absorbed by the liquid due to solubility levels or by chemical reaction. Counter-flow scrubbers have a smaller footprint and can have higher removal efficiency than a Monroe Horizontal Packed Bed Scrubber. 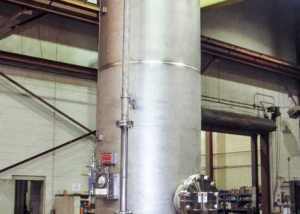 The vertical counter-flow design typically provides the best scrubbing efficiency of vapors and is the most common design found in most industries. 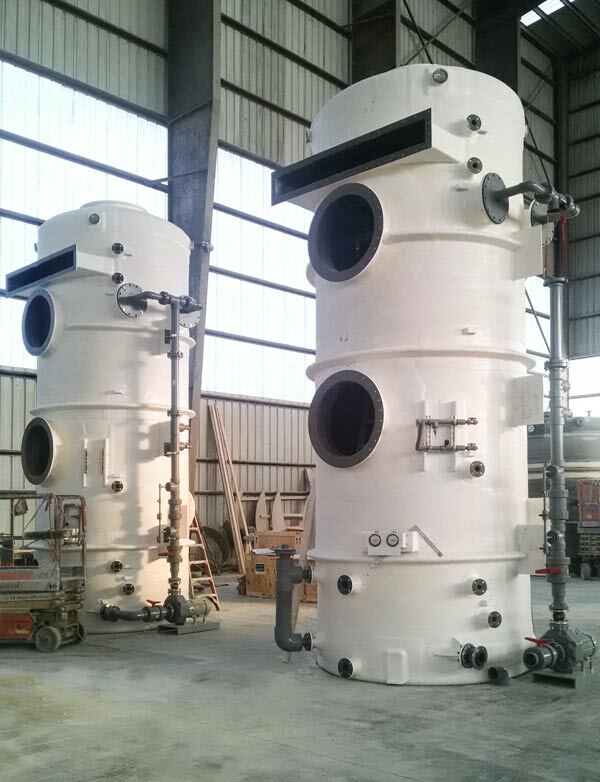 The Monroe Vertical Packed Tower Scrubber is normally not used when solid particulate is in the air stream. 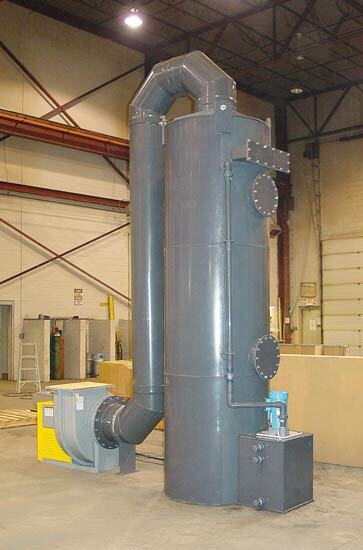 Air flow capacity for a single shop fabricated tower can be up to 75,000 CFM. 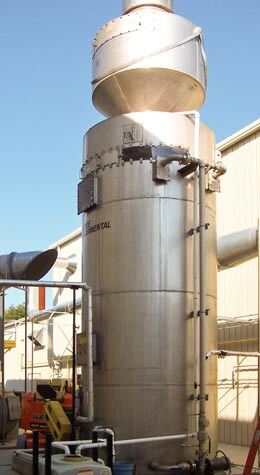 This is a cross-flow design with scrubbing liquid flowing vertically downwards while the gas passes horizontally through the packing section. 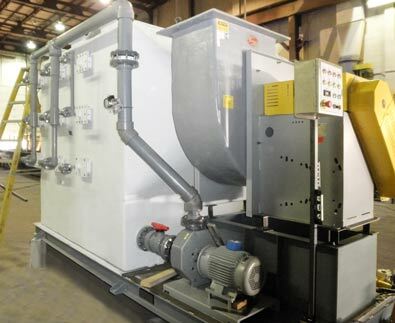 A Monroe Horizontal Packed Bed Scrubber is used when limited headroom is an issue at a customer’s facility or when low profile is desired for roof-top applications. 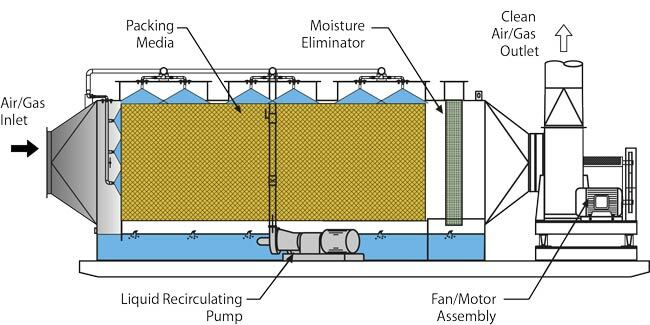 Multiple stages can be easily provided in one housing with separate sumps and pumps if required. 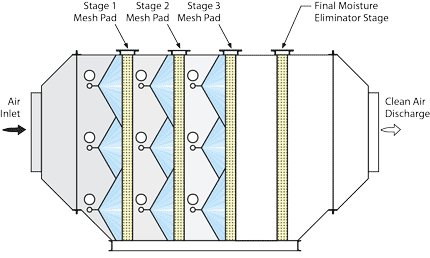 The cross-flow design is less susceptible to fouling for airstreams that may contain solid particulate. 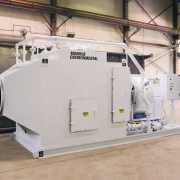 Air flow capacity for a single shop fabricated tower can be up to 75,000 CFM. 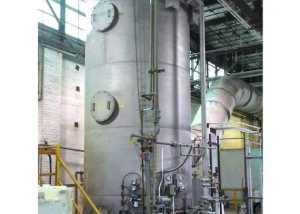 Emissions from chrome plating and chromic acid anodizing operations produce hexavalent chrome mist that cannot be effectively removed in a conventional packed tower scrubber. 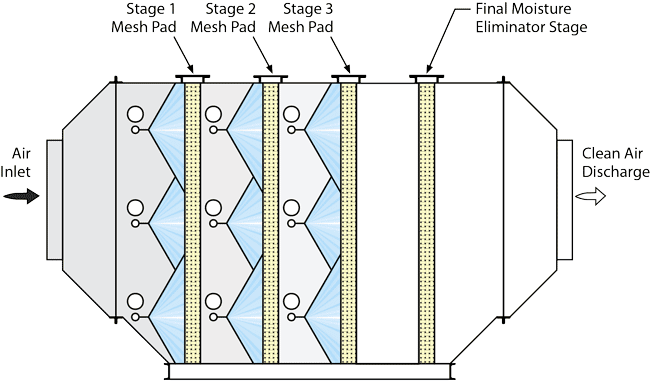 A modified type of horizontal scrubbing unit using specialized mesh filter pads with periodic flushing is required to meet regulatory guidelines for this contaminant. PVC construction is typical. 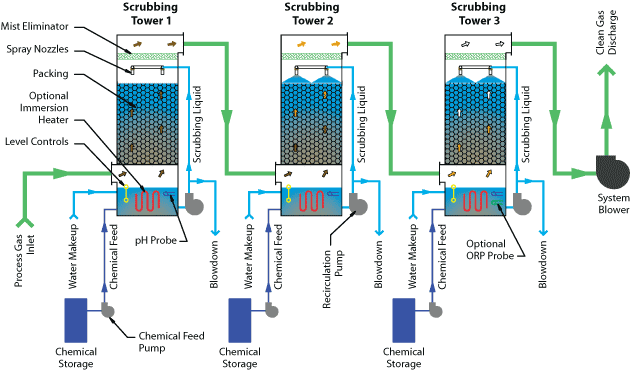 Multiple scrubbing stages with different scrubbing solutions can be achieved by providing multiple scrubbing towers in series. 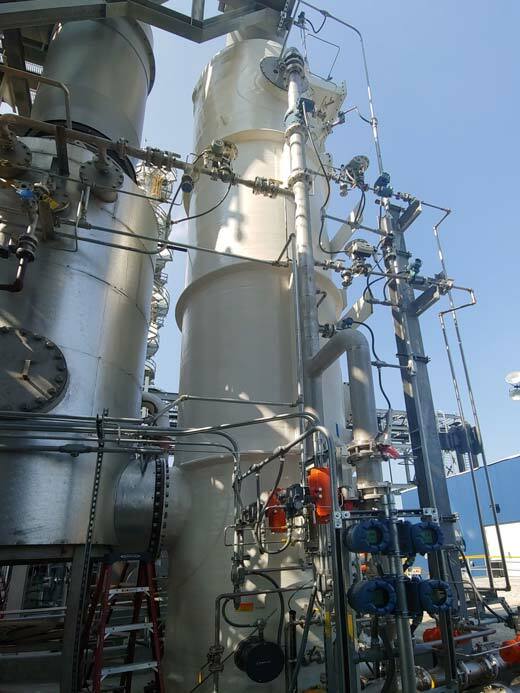 These configurations can provide the highest removal efficiencies as well as multiple gas constituent removal. 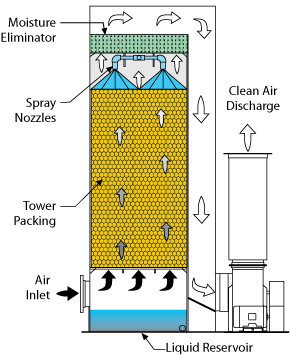 The diagram below includes three towers in series that could be used for H2S and ammonia removal. 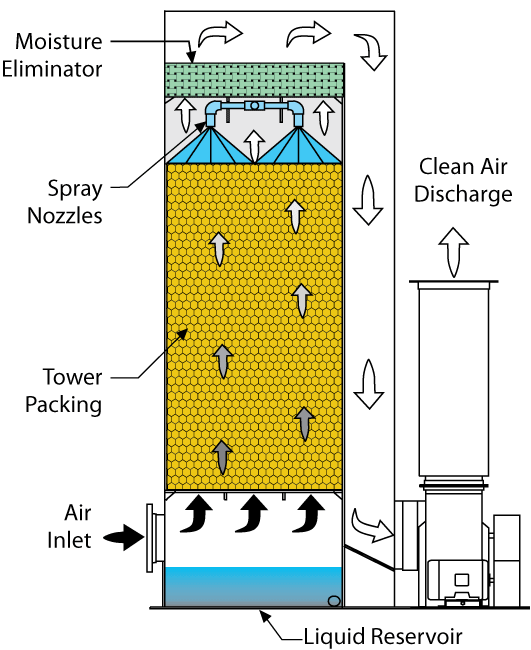 A Bioscrubber uses living microbes to consume pollutants from an air stream. This technology will efficiently remove gasses that cause odors at wastewater treatment plants such as H2S, dimethyl sulfide (C2H6S), carbonyl sulfide (COS), and methanethiol (CH4S). 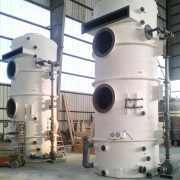 Bioscrubbers can effectively remove aldehydes, organic acids, nitrous oxide (N2O), sulfur dioxide (SO2), and a range of water-soluble VOCs. Often less expensive: the pollutants in the air stream feed and sustain the microorganisms that consume them. 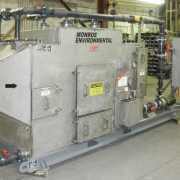 Avoids the expense of continually adding scrubbing chemicals. The process is green. It does not produce NOX or CO like combustors do. 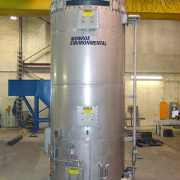 Chemicals requiring disposal are not generally produced. The products of a bioreaction in which microbes consume hydrocarbons are mainly CO2 and water. 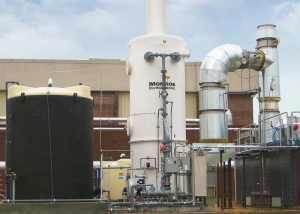 Monroe Environmental experts will analyze your application to determine if a biological solution is appropriate. Extremes of hot and cold will limit the effectiveness of microbes. Most microbes thrive in a moist environment that is around neutral pH, near 7. 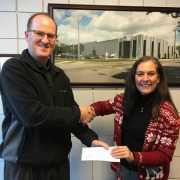 Monroe will analyze the variables of temperature, moisture, pH, nutrient mix, and residence time to achieve conditions that will support a microbial population that will efficiently consume and remove the air pollutants that occur in a particular application. 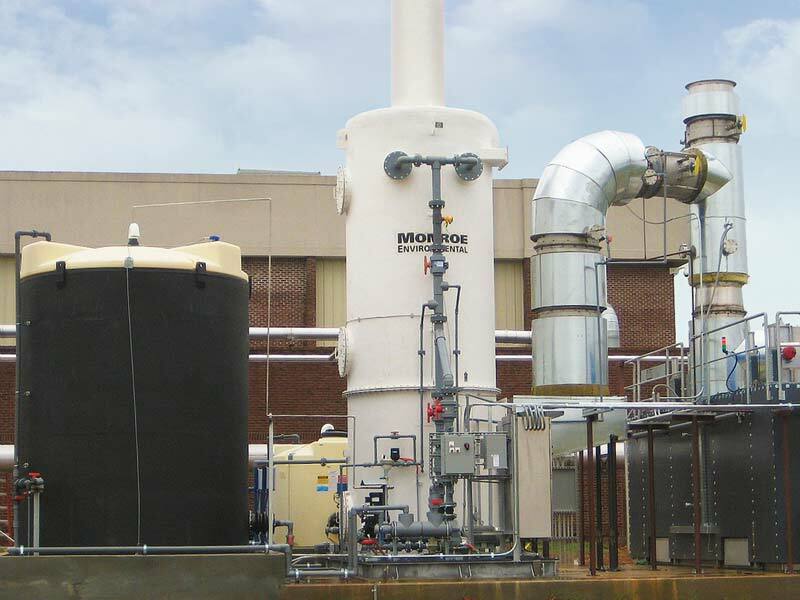 Monroe Environmental will custom-design a biological scrubber for each application and manufacture it in-house. 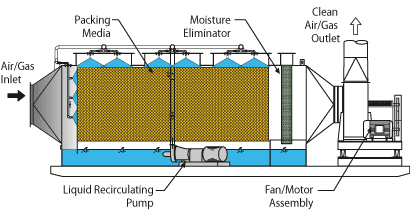 Units may range from a simple bio-filter tank with drain to a complete electronically controlled biological scrubbing system employing blower, liquid pumps, media with supporting structure, and a sump with nutrient addition and pH control to treat water that is distributed to the biological film living on the media. 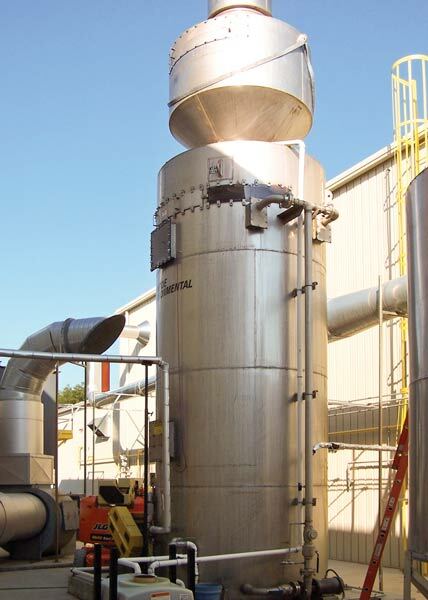 Monroe Environmental Packed Tower wet scrubbing system to capture and neutralize hot, nitric acid emissions from a production dryer at a ceramics manufacturing company. 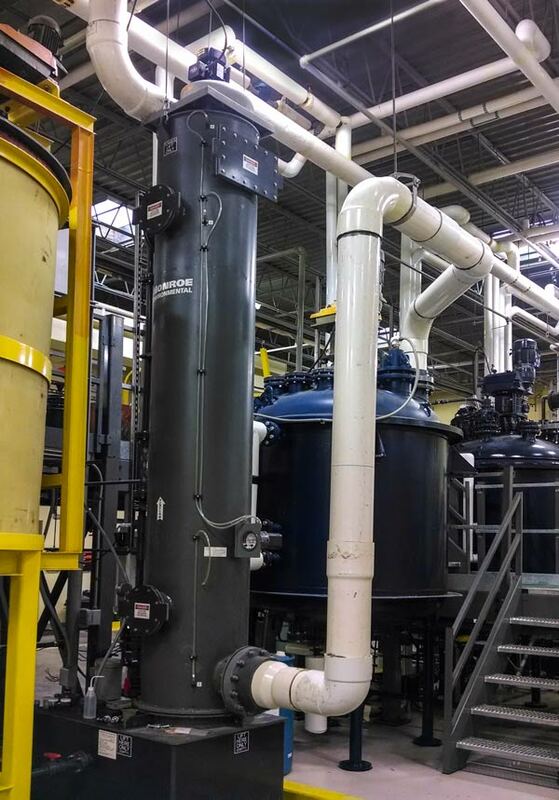 A Monroe Wet Scrubber system was contracted to capture and neutralize the toxic gasses at a pharmaceutical manufacturing plant. 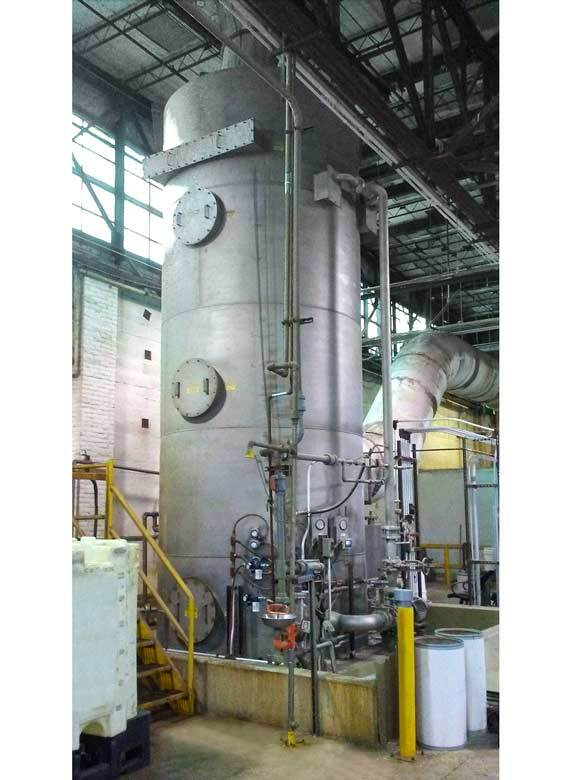 A chemical plant that produces coal tar pitch was expanding operations and needed to control flue gas emissions from a new boiler. 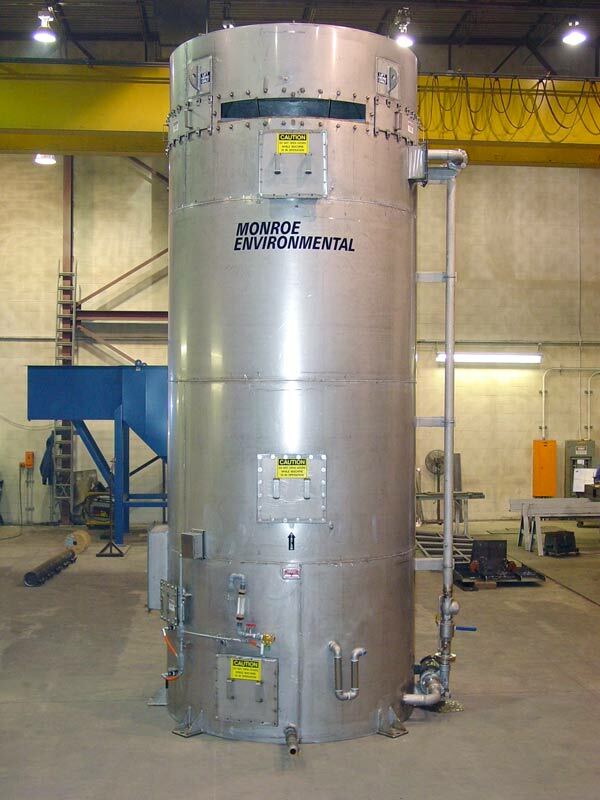 Monroe Packed Tower Wet Scrubber for wastewater treatment plant to absorb and neutralize SO2 from bio-solids incineration exhaust. 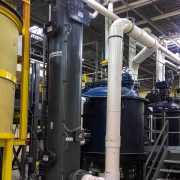 30,000 CFM Horizontal Packed Bed Wet Scrubber System absorbs and neutralizes acid gasses from acid dip tanks. Sulfur dioxide (SO2) is common in flue gasses from many combustion processes. 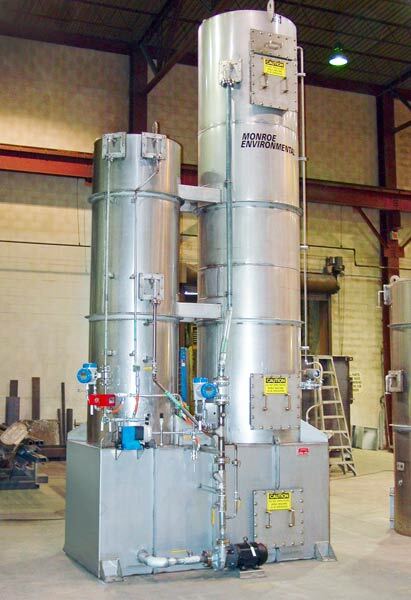 Typically, Monroe Environmental will provide a Quench Tower in a high temperature application such as this before a vertical counter-flow Packed Tower Scrubber. 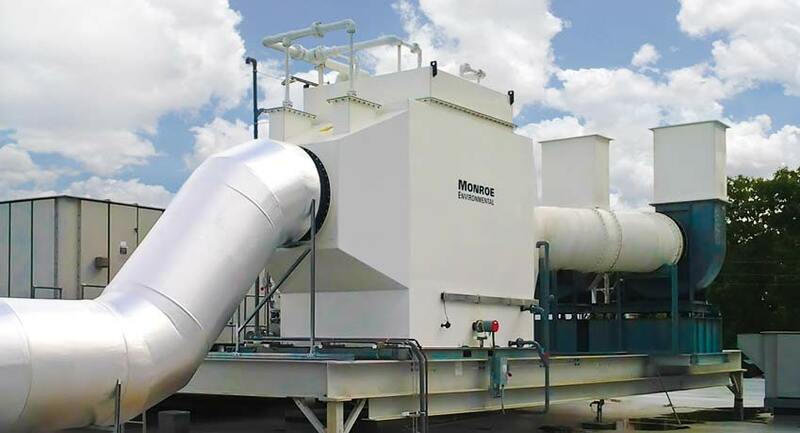 Monroe Environmental provided a multi-stage wet air scrubbing system for HCl and particulate removal from incinerator exhaust at an industrial waste plant. 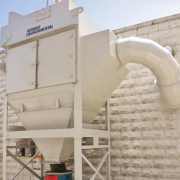 Custom designed Multi-Stage System to provide high efficiency scrubbing of the phenol & formaldehyde, as well as separation and removal of the dust particulate.